Farrokhifar, S., Jafari, R., Erfani Majd, N., Fatemi Tabatabaee, S., Mayahi, M. (2013). Effects of dietary vitamin E on mucosal maltase and alkaline phosphatase enzyme activities and on the amount of mucosal malonyldialdehyde in broiler chickens. Veterinary Research Forum, 4(4), 221-225. Seyed Hamid Farrokhifar; Ramezan Ali Jafari; Naeem Erfani Majd; Seyed Reza Fatemi Tabatabaee; Mansour Mayahi. "Effects of dietary vitamin E on mucosal maltase and alkaline phosphatase enzyme activities and on the amount of mucosal malonyldialdehyde in broiler chickens". Veterinary Research Forum, 4, 4, 2013, 221-225. Farrokhifar, S., Jafari, R., Erfani Majd, N., Fatemi Tabatabaee, S., Mayahi, M. (2013). 'Effects of dietary vitamin E on mucosal maltase and alkaline phosphatase enzyme activities and on the amount of mucosal malonyldialdehyde in broiler chickens', Veterinary Research Forum, 4(4), pp. 221-225. Farrokhifar, S., Jafari, R., Erfani Majd, N., Fatemi Tabatabaee, S., Mayahi, M. Effects of dietary vitamin E on mucosal maltase and alkaline phosphatase enzyme activities and on the amount of mucosal malonyldialdehyde in broiler chickens. 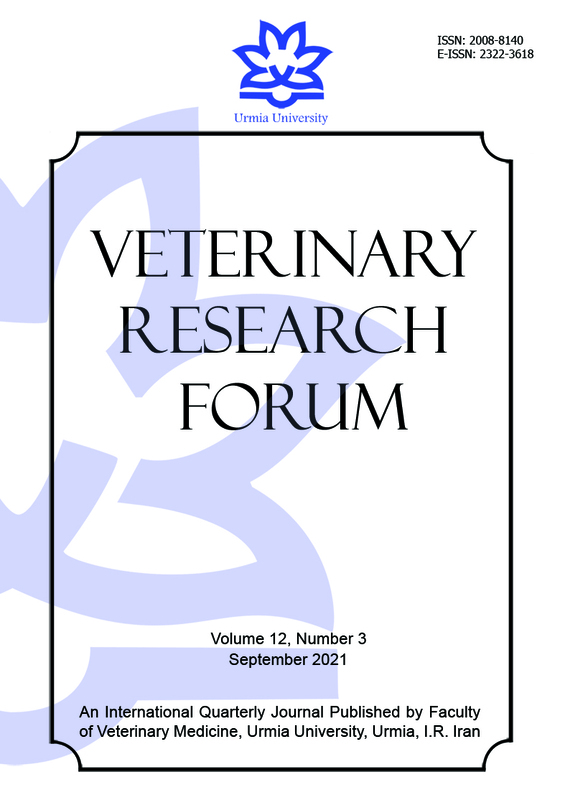 Veterinary Research Forum, 2013; 4(4): 221-225. The effects of dietary vitamin E levels on mucosal maltase and alkaline phosphatase (ALP) enzyme activities and on the amount of mucosal malonyldialdehyde (MDA) in broiler chickens were studied in the present study. One hundred and eighty of day old male broiler chicks (Ross 308 strain) were randomly assigned into five groups, each with three replicates and 12 chicks in each replicate. Chickens in group A were fed corn-soy- based diet, while those in groups B, C, D and E were fed the same diet with 20, 60, 180, and 540 mg kg-1 vitamin E supplement (d-alpha tocopherol), respectively. Six birds were randomly chosen from each group, and were euthanized on days 10, 21, 32, and 42 of age. One segment of small intestine outset was homo-genized and mucosal ALP and maltase activity were measured. Moreover, mucosal lipid peroxidate amount was measured to reveal the impact of vitamin E on oxidative stress. Maltase activity was increased with the increase of vitamin E up to 60 mg kg-1 of diet while with further levels, it was decreased. Addition of 60 mg kg-1 of vitamin E to the diet significantly increased ALP enzyme activity (p ≤ 0.001). Addition of 540 mg kg-1 of vitamin E supplement to the diet led to the minimum amount of MDA at 32 days of age. It may be concluded that supplementation of broiler's diet with 60 mg kg-1of vitamin E can increase mucosal maltase and ALP enzyme activity.